Yesterday we showed that, over time, Wins is a good indicator of how good a pitcher is. However, with any good statistic, there are exceptions that prove the rule. Today, we will look at those pitchers for whom Wins does not indicate how well or how poorly they have pitched. *In this case we are measuring Win Percentage as wins per game started. This differs from the traditional method of measuring Win Percentage in which Wins are only compared to Losses. Using that formula, we can look at every pitcher with 600 innings pitched over the last four seasons (150ip/season) and use their Predicted Win Percentage to calculate how many games they should have won. Surprisingly, 38 of the 51 pitchers (74.5%) were within 5 wins of their predicted total for the past 4 seasons combined (complete list after the jump). Only 7 pitchers (13.7%) deviated from their expected win total by more than 8 wins (>2 wins per season). Not surprisingly, Josh Beckett has benefited greatly from pitching for the Red Sox the past four years. Meanwhile, Matt Cain has fallen victim to the anemic offense of the Giants. Vicente Padilla has been helped by the Rangers strong offense, having twice won 14 games despite not having an ERA under 4.50 the last 4 seasons. Meanwhile, Jarrod Washburn and Zach Duke have lost a lot of games despite pitching close to league average. On the other hand, we were surprised to see how lucky Justin Verlander has been with the Tigers, especially when one considers that he went 11-17 last year. Still, the most surprising aspect of all of this is that only 7 of the 51 pitchers deviated by more than 2 wins per season over the last 4 years. That is the same number of pitchers that were within 1.5 wins of their expected win total, further supporting the notion that Wins is indeed a good evaluator of a starting pitcher. Just because everybody wants to point out Zach Greinke's numbers...if I apply Greinke's 159 ERA from the past 2 seasons combined, he has pitched like a pitcher that should win 36.5 games. He has won only 29. So just in the last 2 seasons he has deviated from expected by a whopping 7.5 wins. Obviously, when comparing that to the above list, that sort of deviation is rare. I think part of the reason some people (myself included) don't like wins as a stat for pitchers is that it is often invoked when making an argument that goes against other stats such as ERA. 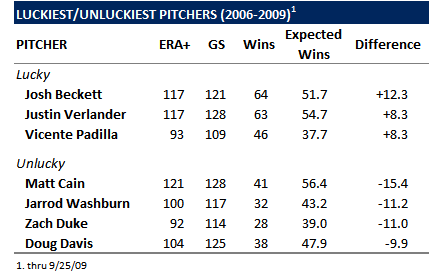 A good example is those who argue against Greinke winning the CY because he doesn't have the most wins. My feeling is that I don't mind somebody using Wins to judge Cy Young as long as they also look at other factors. I also wouldn't mind if somebody ignored wins alltogether. But I wouldn't want any stat being the sole basis for Cy Young. Would it be possible to generate a stat that reported a pitcher's wins in relationship to his team's wins? E.g. how far his win-loss record deviates from the team W-L record? That might be a way of using wins but "controlling" for a lousy team. Do you even know what the expression "exception proves the rule" means? Hint: It does not mean that Matt Cain "proves" wins are a valid way to evaluate pitchers. It means that Matt Cain poses a challenge to the hypothesis that, as a rule, wins tell you anything about a pitcher, even when evaluating pitchers on the same team and only against one another. The expression means that for a proposed rule to be adpted as an actual rule, it must account for apparent exceptions. Wins can't account for Matt Cain, Zack Greinke, or Tim Lincecum. In this case, the exceptions prove the "rule" is bogus. That's actual English: the words you used really mean the opposite of what you claim. And the actual facts you used (and many more just like them) really show the opposite too. I only wonder if your next move will be to say this was an attempt at a viral prank. *yawn* next time, I will type slower for you. or I can recommend a good remedial reading class for you. because I would love for you to show me where I said Matt Cain "proves the rule." Or where I said any of this data proves any rule. In fact, I have proposed no rules at all. Jeez, the man throws out an idea that interests him, and your treat him as though he's arguing the world is flat! Why the vitriol? 1) I think that a lot of the vitriol comes because there are many out there, (some of whom vote on the Cy Young), who would reject the fact that there are many other metrics that are better than Wins in comparing pitching quality in a single season. I believe that people think you are giving support to the type of statistical luddite who would put Sabathia before Greinke. 2) I think the study you did for part 2 is very badly designed. When we look at wins the "natural" unit is either a season or a career. Of course as we increase the sample size Wins is going to be closer to a better quality measure as much of the statistical noise will cancel itself out. So for a career, Wins are not a terrible measure, But what we care about is a single season. By your ERA+ to Wins function above, Greinke should finish the year with about 24 Wins. Which seems like a much better measure of the quality of his play than his 16 or 17 Wins. By using 4 years together, which no one cares about as a unit, instead of a single year, you look to me like you are much more concerned with winning an argument than advancing the truth. First of all, I agree, if part 2 was the original purpose, this not how I would have collected the data. I believe the dataset works well for part 1. Then, there was some interest in exactly who the outliers were, so I broke it down by pitcher. And I agree with your second point to an extent. Yes, a single season is more interesting, but do we really judge players based on single seasons? For an award yes. But other times? BJ Upton has a .310 wOBA this season. Do you think he is a .310-player? Actually, he should be much closer to .380-.400. And why is he down this season? A bum shoulder. No spring training. Too much booing by the fans. All of these things are somewhat outside if his everyday control. And as a result, he had a poor wOBA this season that is not indicative of how good of a player he is. It happens. There are far too many variables in baseball. You will never be able to control/measure all of them. So maybe nobody cares about units of 4 years, but we all care about units of greater than one year. Fans do. Teams do especially. There is far too much variability in a single season to ever define a player. If that was the case, players like Brady Anderson and Brett Boone and Mark Fidrych would be in the Hall of Fame. How about for individual seasons with an IP minimum of, say, 100 or 120 IP?